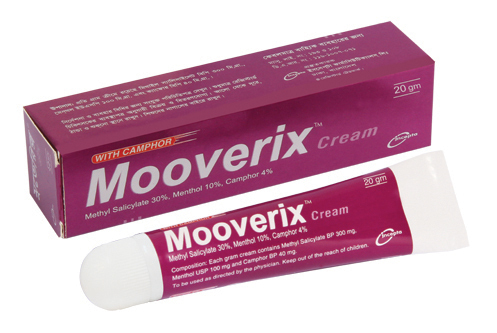 Mooverix Cream: Each gram cream contains Methyl salicylate BP 300 mg, Menthol USP 100 mg & Camphor BP 40 mg.
Mooverix is a specially formulated Methyl salicylate, Camphor and Menthol cream. It penetrates into skin to provide fast relief from pain and stiffness of minor arthritis and muscle aches. Mooverix cream is fast acting, strong medicine that penetrates deep down to provide long lasting and effective relief. Methyl salicylate has been shown that first pass metabolism exists in the skin and rapidly hydrolyzing salicylate ester to release the active salicylate in both epidermis and dermis. It alleviates pain and inflammation by inhibiting the synthesis of prostaglandins that occur in inflamed tissues. Camphor numbs the nerve endings. The nerve endings then no longer transmit the sensation of pain. Camphor is highly volatile and readily absorbed through the skin. It produces a cool sensation and acts as a mild local anesthetic. Menthol increases the penetration of drugs when applied on the skin to give a faster onset of action. It dilates the blood vessels causing a sensation of coldness followed by an analgesic effect. Adults and children 12 years of age and older: apply on affected area not more than 3 to 4 times daily. Children under 12 years of age: use on advice of a doctor. Redness or irritation may occur, especially in persons with sensitive skin. Adverse reactions possibly involved are mild to moderate local irritation, erythema, rash, desquamation, pruritis and relative local reaction at the application site. Avoid contact with the eyes and mucous membranes. Do not bandage tightly, wrap or cover until washing the area. It should not be applied to wounds or damaged skin. It should not be used immediately after bath. Wash hand thoroughly after applying. Its safety in human pregnancy has not been established. This preparation should therefore be given to pregnant women only in compelling circumstances.